I wonder, said Hermes, what it would be like if animals had human intelligence. I’ll wager a year’s servitude, answered Apollo, that animals – any animal you like – would be even more unhappy than humans are, if they were given human intelligence. Andre Alexis’s contemporary take on the apologue offers an utterly compelling and affecting look at the beauty and perils of human consciousness. 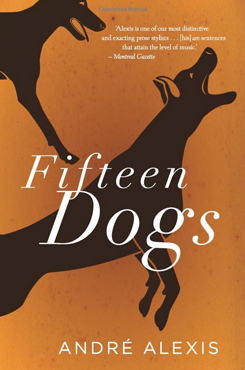 By turns meditative and devastating, charming and strange, Fifteen Dogs shows you can teach an old genre new tricks.